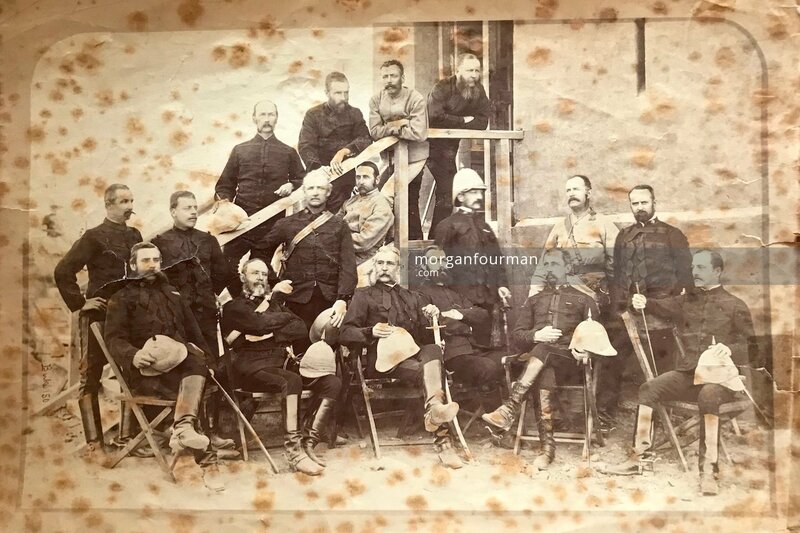 Among the photos in the Evans’s family archive is a formal group portrait of British Army Officers by John Burke known for his photographs of the Second Anglo-Afghan War (1878-1880). Most likely it came from General Charles Richard Ogden Evans‘s military memorabilia. The photographic print is signed and numbered in the negative as ‘Burke 150’. It is very similar to two other Burke’s group portraits available on the British Library Online Gallery – see one and two. There is a possibility that the Evans’s photograph originates from Captain David Anderson Ogden (1839-1889) of the 2nd Battalion, 14th (the Prince of Wales’ Own) Regiment. Captain D.A. Ogden and General C.R.O. Evans were complexly related. Firstly, they were first cousins. Secondly, Captain Ogden’s first wife Charlotte Edith Ogden (nee Warburton) was the General’s niece. Finally, Captain Ogden’s daughter Edith Ogden was adopted by the General after the death of her mother in childbirth. Captain Ogden joined the 2nd Battn. 14th P.W.O. Regt. in Dec 1877 and served with it until May 1882 when he took retirement with the honorary rank of Lieutenant Colonel. At the start of the Second Anglo-Afghan War the 2nd Battn. 14th P.W.O. Regt. was stationed at Lucknow, India. In Dec 1879 it was relocated to Peshawar to form part of the Reserve Division of the force operating in Northern Afghanistan and it was engaged in the military actions from Jan to Aug 1880. Captain Ogden took part in the Kama expedition in Jun 1880. It is known that photographer John Burke accompanied the Peshawar Valley Field Force, one of three British Anglo-Indian army columns deployed in the war. If it is Captain Ogden, who is on the photograph (possibly fourth right – see his 1864 portrait), the group would be Officers of the the 2nd Battn. 14th P.W.O. Regt. and the date would be 1880.